Tuberculosis (too-ber-ku-LO-sis) is a bacterial infection that spreads through the air and usually affects the lungs. Worldwide, it kills more people than any other infectious disease. Hippocrates, a Greek physician who today is called "the father of medicine," accurately described tuberculosis (TB) about 2,400 years ago when he coined the term "phthis," which means to melt and to waste away. In later years, tuberculosis was called consumption, because people with TB tended to waste away as if they were being slowly consumed. Not everyone who is infected with tuberculosis bacteria (called primary infection) gets sick or infects other people. About 10 million people in the United States are infected with tuberculosis, but only one out of every 10 of these people will develop active TB (called secondary infection). People with primary TB infection are protected from developing active TB by their body's immune system * , but they still carry the bacteria in their bodies. As long as the infection is inactive, they cannot spread TB. They can, however, develop active (secondary) TB years later if their immune systems are weakened by other diseases such as AIDS, diabetes, or by alcohol or drug abuse. Most people with active TB who are treated can be cured. If left untreated, however, TB is fatal 40 to 60 percent of the time. When people with active tuberculosis of the lungs or throat cough or sneeze, they spread bacteria through the air. Other people who breathe the same air may become infected with the bacteria, which can lodge in the lungs and begin to grow. From there, the bacteria can move through the blood and settle in almost any other part of the body, including the urinary tract, brain, lymph nodes * , bones, joints, peritoneum * , and heart. People with active tuberculosis are most likely to give it to those they spend a lot of time with over a long period, such as family members, close friends, and coworkers. Even with close contact, however, only one third of people who are exposed to TB infection become infected. People who have primary tuberculosis cannot spread it to others. TB in parts of the body other than the lungs and throat usually is not contagious. Babies and young children who have weak immune systems. People with medical problems such as HIV (the virus that causes AIDS) infection, alcohol or drug abuse, poor nutrition, diabetes, certain types of cancer, or severe kidney diseases that weaken their immune systems. People who take certain medications, such as corticosteroid drugs that weaken their immune systems. People who have had organ transplants and take drugs to suppress their immune systems. People who do not get good medical care due to poverty or homelessness. * immune system is the body's defense system, fighting off attacks by viruses, bacteria, fungi, and other foreign substances that can cause illness or hurt the body. * lymph node a round mass of tissue that contains immune cells that filter out harmful micro-organisms; lymph nodes can become enlarged during infection. * peritoneum is the membrane that lines the abdominal cavity. In the United States, tuberculosis is a serious disease but is not a leading cause of death or illness. In 1996, for instance, it caused about 21,000 new cases of illness and about 1,200 deaths. It is estimated that 10-15 million people in the U.S. have primary (in other words, nonactive) TB infection. Of these about 1 in 10 will eventually become ill with the disease. In the U.S., TB is most common among people with HIV, people in homeless shelters and prisons, other poor people who live in big cities and elderly people. Rates are higher for men than for women and far higher for people of African ancestry than for people of European ancestry. This may be because a higher proportion of African Americans are poor. Another factor may be that, over the centuries, TB was largely a European disease and Europeans who survived it may have evolved resistance to it. In the U.S., tuberculosis was on the decline until the mid-1980s, when it began to make a comeback. A main reason was the rise of HIV, the AIDS virus, which weakens the immune system. HIV-infected people are more likely to get new TB infections and to have old, inactive infections become active and cause illness. Health officials responded to the upsurge with better TB control programs, and rates of TB went down again. By the late 1990s, the number of new U.S. illesses was the lowest ever and was dropping each year. Worldwide, TB causes more deaths than any other infectious disease. In 1997, it was estimated to cause about 8 million new cases of illness and about 2 million deaths, on top of 16 million existing cases of illness. It is estimated that one-third of the world's people have primary (inactive) TB infection. That means 2 billion infected people. Worldwide, most tuberculosis cases occur in Asia. About 4.5 million of the 8 million new cases each year occur in India, China, Bangladesh, Pakistan, Indonesia, and the Philippines. But the rates—the number of cases that occur for each 100,000 people—tend to be highest in some African countries. That's because HIV is particularly common there and HIV-infected people are more like to get sick with TB. Many cases of tuberculosis also occur in the Mideast and South America. In the developing world, TB is most common among young men and women of reproductive age. Worldwide as well, the spread of tuberculosis has been fueled by the rise of HIV, but it has not been brought under control. The World Health Organization has been trying to get countries to use the kind of control measures that worked in the U.S. in the 1990s. But the control measures are expensive and difficult to do on the large scale that is needed, and the countries that need them most are not as wealthy as the U.S.
Primary tuberculosis does not cause any symptoms. The symptoms of secondary (active) tuberculosis depend on where in the body the tuberculosis bacteria are growing. Tuberculosis of the lungs may cause a cough that does not go away, pain in the chest, and coughing up blood or sputum * . Other common symptoms include feeling tired all the time, weight loss, lack of appetite, fever, chills, and sweating at night. However, some people with active TB feel well and only cough occasionally. Archeologists have found evidence of tuberculosis in skeletons from Peru that are 1,300 years old and in Egyptian skeletons dating back 3,400 years. ButTB apparently did not emerge as a major killer until the 1600s in Europe. By the 1800s, the Industrial Revolution had created ideal conditions for TB to spread—overworked, underfed people crowded together in tenements and factories with poor ventilation. TB became the leading killer in many European and U.S. cities. It even took on an aura of romance, as it sapped the life from many literary figures, both real (the poet John Keats) and fictional (the heroine of the opera "La Boheme"). It was unclear whether TB was inherited or infectious until the 1880s, when the German physician Robert Koch (1843-1910) identified the TB bacterium. Treatment consisted of rest, rich food, and fresh air, often provided in special TB hospitals called sanitoriums that were built in mountain areas. Streptomycin, an antibiotic that kills TB bacteria, was introduced in the 1940s. Isoniazid, another effective antibiotic, came into use in the 1950s. Both are still used today, along with other drugs. As drug-resistant strains of TB continue to emerge, research toward better treatment continues as well. Urinary tract. Symptoms may include repeated urinary tract infections, repeated fevers, or pus or blood in the urine for which there is no other explanation. Brain. Tuberculosis bacteria can infect the membranes surrounding the brain and spinal cord (the meninges), especially in babies and young children. Symptoms of tuberculosis meningitis may include headaches, seizures, or abnormal behavior. Lymph nodes. Tuberculosis bacteria can infect the small organs commonly known as lymph nodes. Symptoms may include inflammation and swelling of the nodes anywhere in the body, including in the neck. Bones and joints. Tuberculosis bacteria can infect the skeleton, especially in the elderly. Symptoms may include fever, pain, and stiff, swollen joints. The lower spine and weight-bearing joints are most often affected. A lab technician performs a TB test on a young boy while his mother watches. Peritoneum. Tuberculosis bacteria can infect the inner lining of the abdomen. Symptoms may include a fever and buildup of fluid inside the abdomen. This often goes along with a buildup of fluid around the lungs. Heart. Tuberculosis bacteria can infect the sac enclosing the heart. Although this is extremely rare, the death rate is high when it does occur. Symptoms may include short-ness of breath, chest pain, and fever. A skin test is used to diagnose primary of testing fluid is injected with a fine needle just beneath the skin on the lower part of the arm. Two to three days later, a healthcare professional checks the arm. If a bump of a certain size is present, the test is positive, and a diagnosis of primary tuberculosis is made. Doctors may order more tests, such as a chest x-ray and a test of sputum that is coughed up, to see if secondary (active) tuberculosis is present. People who have spent a lot of time with other people who are infected with TB. People who think they may have caught the disease for other reasons. People who have HIV infection or other medical problems that put them at high risk for getting tuberculosis. People who come to the United States from countries where tuberculosis is more common (most countries in Latin America and the Caribbean, Africa, and all of Asia except for Japan). People who live in the United States in environments where tuberculosis is common (homeless shelters, migrant farm camps, prisons, and some nursing homes). 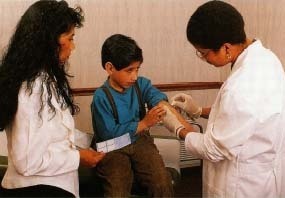 ■ The measures advocated by the World Health Organization are called DOTS, for "directly obseved treatment—short term." Under this system, health workers watch patients take their medicines each day for six months to a year, either at a clinic or on visits to the patient's home. This ensures that the patients complete their treatment, rather than stopping whenever they feel better. That cuts down on the spread of the illness and on the emergence of drug-resistant strains. People with primary tuberculosis who are in high-risk groups for developing active TB may be given medication to help ward off the illness. This is called preventive therapy. People under age 35 with primary tuberculosis who are not in high-risk groups also may benefit from preventive therapy. The goal is to kill the bacteria that are not doing any harm now, but that could cause active TB in the future. The medication usually given for this purpose is called isoniazid (INH). To kill these bacteria, however, INH must be taken every day for 6 to 12 months. Secondary (active) tuberculosis can often be cured with medication. People with secondary TB usually take several different drugs, because this does a better job of killing all the bacteria and preventing the formation of resistant bacteria that cannot be killed by drugs. Although they usually feel better after a few weeks of treatment, people with active TB must continue to take their medication correctly for the full length of the treatment or they can become sick again. Since people with tuberculosis of the lungs or throat can spread the infection to others, they need to stay home from school or work until they are no longer infectious to others; this usually takes a couple of weeks. People with tuberculosis who are sick enough to go to the hospital may be put in a special room with an air vent system that keeps the bacteria from spreading. Doctors, nurses, and others who work in such rooms must wear special facemasks to protect themselves from breathing the bacteria. How Can the Spread of Infection Be Stopped? People who have tuberculosis can keep from spreading the infection by taking all their medication exactly as prescribed, visiting their doctors regularly, staying away from people until they are no longer infectious to others, covering their mouths with a tissue when they cough, sneeze, or laugh, and airing out the room often. Tuberculosis bacteria can only be spread through the air. Other people cannot be infected by shaking hands, sitting on toilet seats, or sharing dishes or personal items with people who have tuberculosis. Bacillus Calmette-Guerin (BCG) is a vaccine that can help protect people against tuberculosis infection. It does not always work and may cause a positive reaction to the tuberculosis skin test, making it harder to tell if people become infected despite the vaccine. BCG is not widely used in the United States, but it often is given to babies and young children in countries where tuberculosis is common. Multi-drug resistant (MDR) tuberculosis, caused by bacteria that cannot be killed by regulartuberculosis drugs, is very dangerous. Even with treatment, 40 to 60 percent of people with MDR tuberculosis die. People with MDR tuberculosis must take special medications that do not work aswell as the usual tuberculosis drugs and that have more side effects. People with tuberculosis who do not take their medication correctly, or who do not finish it all, can get MDR tuberculosis, and they can spread the infection to others. MDR tuberculosis is common in some parts of the world, including Southeast Asia, Latin America, Haiti, and the Philippines. The red spot on the arm indicates a positive skin test forTB. U.S. National Center for HIV, STD andTB Prevention, 1600 Clifton Road N.E., Atlanta, GA 30333. This government agency, part of the U.S. Centers for Disease Control and Prevention, is a good source of tuberculosis information. U.S. National Institute of Allergy and Infectious Diseases (NIAID), Office of Communications and Public Liaison, Building 31, Room 7A-50, 31 Center Drive, MSC 2520, Bethesda, MD 20892-2520. NIAID also posts information about tuberculosis at its website. American Lung Association. 1740 Broadway, New York, NY 10019. This group has information about tuberculosis on its website. World Health Organization (WHO), Avenue Appia 20, 1211 Geneva 27, Switzerland. WHO posts information about tuberculosis and other vaccine preventable diseases at its website.